Adopt and adore your favourite wild animals today! From the makers of ‘A to Z for Kids’, ‘ABC’s are Fun’ & “Pet Animals”! Wild Animals Fun is an easy to use interactive app that will allow little ones to explore a variety of animals and their sounds. The fun animations will keep kids engaged and entertained as they learn. This homeschooling app has two modes: Learning and Interactive games. Tap an animal to take the child to their habitat. From here-on, simply tap on the animal, and see your child learn: how the king of the jungle roars; how the Zebra jumps, or how the Bear enjoys his food! It is guaranteed that even a random tap on the animals would make the animal move; also each animal has got its unique game. This constant interaction is bound to keep the toddler engaged, and entertained for hours. Fun while you learn app!! If these features aren’t enough, there’s more! Every animal has something special to offer. Make the Monkey scratch his back and make him jump with joy, feed the Giraffe with healthy leaves and tasty water to drink, make the bear growl with hunger and feed him with Bananas and many more interactive features. To explore more, simply download Wild Animals now, and see your child learn with fun! Download this app for free, and let us know what more would your kids like to have in the coming versions! Features: •	6 Wild Animals to explore. 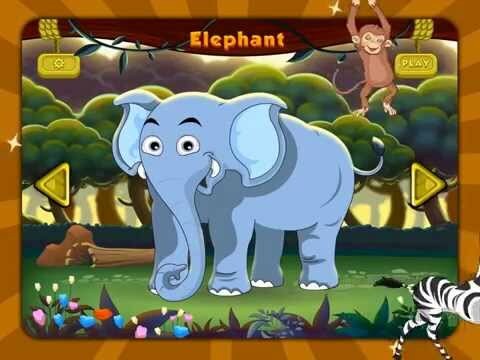 •	2 modes – Learn & Play •	Interactive animations •	Fun animal sounds Follow Wild Animals Fun on Twitter and FaceBook.